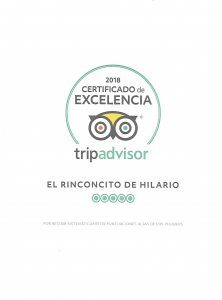 Aunque hace algunas semanas nos lo comunicaron, en el día de ayer hemos recibido el CERTIFICADO DE EXCELENCIA 2018 de TRIPADVISOR, del cual estamos muy orgullosos. MUCHÍSIMAS GRACIAS a todos ustedes por sus comentarios para hacerlo posible, por nuestra parte seguiremos intentando hacerlo igual o mejor si fuera posible!!!! Although a few weeks ago we were informed, yesterday we received the TRIPADVISOR CERTIFICATE OF EXCELLENCE 2018, of which we are very proud. MANY THANKS to all of you for your comments to make it possible, for our part we will continue trying to do the same or better if possible!!! !